Farming Foible, or an Agrarian Adventure? 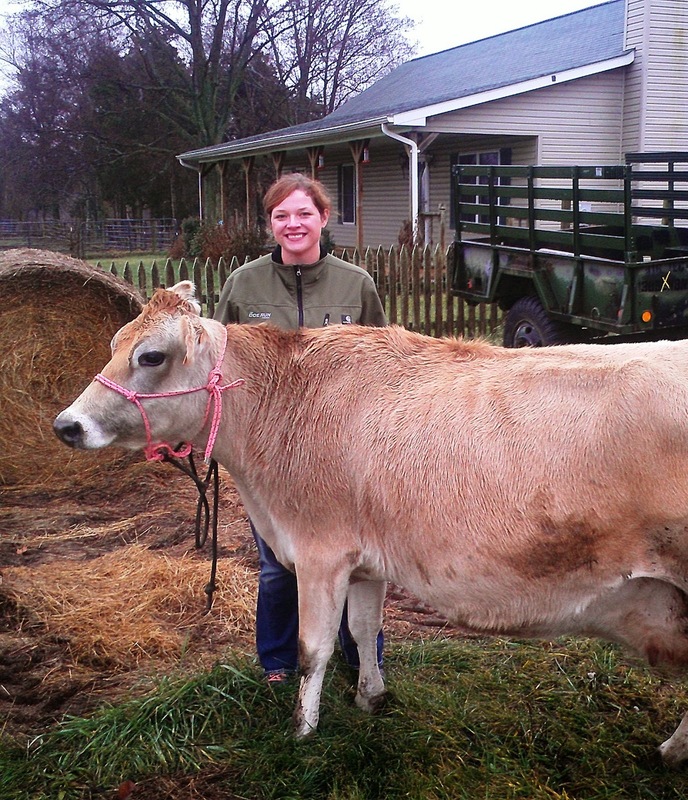 : Hug a cow in 2015! Sorry for the delay in posting. Things get kinda crazy around here during the holidays. My friend Rachel said it perfectly when she described getting ready for them thusly: "Two weeks of constant cleaning and arranging so you look like you just rented the house for the day, and that no one actually lives there. Then when everyone is sitting down to dinner you realize that you have no clue where you hid the pepper shaker. That's Christmas." That pretty much sums up the holidays round here. With mom hosting holidays and having a sanctuary for unadoptable Chihuahuas, well, it can take a lot of last minute touch ups. Let's just say there are some memories from my younger days that I get to relive - Cinderelly, Cinderelly / Night and day it's Cinderelly / Make the fire, fix the breakfast / Wash the dishes, do the mopping. Just kidding, I actually enjoy being able to help mom out. It reminds me of when I still lived there and we would spend every Saturday cleaning. Maybe I'm scarred or something, but vacuuming that house makes me nostalgic! Last year CA and I spent Christmas Eve with his family and Christmas with mine. We continued that schedule this year, and it seems to work fairly well. I'm really looking forward to having the house I bought finished though. I can't wait to start hosting holidays! But I can tell you how to install outlets and one-way switches, how to fix walls, and I can lay some pretty sweet quarter round. So, it hasn't been for nothing, right? -Self Love February -basically spend time doing the things I enjoy like sketching, reading, cooking that I fail to do so often. Yeah. Clearly that didn't happen. I didn't do so well with "Self Love February" since my grandpa died and I spent most of it wallowing in various stages of grief. I didn't fix Pearl's pen because another mare went blind in the pen next door and decided to play ping pong with the vinyl boards every time the wind blew hard. So, until the blind ones either pass on or get moved it is fairly pointless. I almost cleaned out all the feed sacks and the old barn, but then I got distracted by the fact that the barn was falling down and never finished. I never used my canner this year, but I froze the tomatoes and potatoes; that sorta counts, right? I didn't work much on mom's or CA's basement, and I took down some wallpaper as my contribution to CA's house remodel. I did however buy him a spare set of high thread count sheets so I did improve his quality of life somewhat. Don't get me wrong, I accomplished a ton last year. I am almost into Evelyn's house. We have cleaned some of grandpa's sheds. I grew SO MUCH squash. I got a milk cow, courtesy of CA (:)). I didn't finish editing my book, but I started writing another. I took time to get pedicures, like three or four times. I kept hay in front of the cows. I learned how to jack up a falling down barn. I learned how to run a mile. I bought my own trimmer and kind of kept my yard trimmed in addition to the fences. I took three amazing trips. I made memories with my loved ones, and so much more. So this year I am going to change it up a little bit. For one thing I am going to actually share my to-do list with CA and my parents and see what they think and feel about things. -Look better going into 28 years and 730 days old than I did at 20. That's right. Size ten jeans and a trip to the salon here I come. -Move into Evelyn's house, and try to sell the trailer. -Help CA remodel his house in whatever way I can. -Plant flowers and vegetables. I may cease weeding by July, but by God it makes me happy. Heck, try to make more time for the Zen of Weeding. -Stop. Breathe. Enjoy Life. Slow down and weed, pet the milk cow, pick cherries, watch a sunset, or paint. Learn from 2014. All those chores will still be there later, or even next year. Clean the barn on a gorgeous day when it makes my heart sing to be outside, but not because I have to. -Help people more. Whether that is mom and dad cleaning the basement, or volunteering somewhere. -Spend more quality time with friends, family, and critters. -Take time to be creative: edit the book, work on the new book, learn Italian, daydream, meditate, learn to make cheese, bake more breads, learn to distill essential oil, ANYTHING. -Try to not get overwhelmed as often by everything that I feel like I have to do. That last one is the big one. It is so easy to get caught up in the rush of day to day living. I spend so much time rushing from one job to the next, and spending the time in between jobs strategizing how to do them more efficiently. It is going to take some conscious effort, but I am really going to try to slow down. How about you? Want to keep me accountable in 2015? Want to share your goals? Want to hug a cow? Of course you do. Hug a cow in '15!